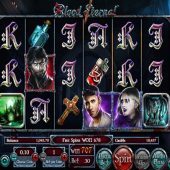 Blood Eternal slot is Betsoft's HD glossy release with a dark theme, in this case vampires and all things Gothic and is a little more hard hitting than say Merkur's Vampires game or Netent's Bloodsuckers 2. We play with transparent reels over a backdrop of a candlelit hall in the haunted castle and spooky classical music supplies our soundtrack as we spin. We know we will always get top class graphics and animations from Betsoft, but will these Vampires sink their teeth in your bankroll too? Unusually Blood Eternal has 6 reels but only 3 rows unlike the normal 4 rows you tend to see on 6-reel slots such as Danger High Voltage and Raging Rhino. This is because the game is not multiway and you only pay 30 coins for 30 fixed paying lines, which also pay right-to-left. Symbols appear stacked too and despite this the pays are quite good - Wilds aren't stacked and don't actually appear in the base game but pay 30x bet for a 6-of-a-kind win, Castle 17x, Cross 13x, Demon 10x, Bottle 5x and pendant 4x for a full line of 6. There are card values in this castle too of which there are four either paying 30 coins or 20 coins. If on either reels 2 and 3 or 4 and 5 the Vampire lands adjacently on the same row as a human victim, you will trigger 8 free games. These 2 positions will then become Sticky Wilds for the duration, and you can retrigger them once by getting the other pair land on the other two reels. 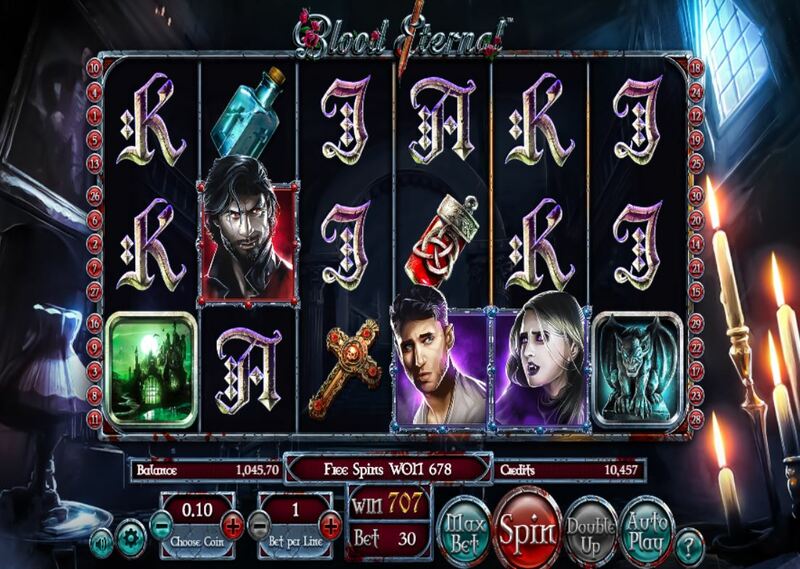 Every spin the Vampire will bite the Victim and blood will splatter onto 1 to 4 random positions on the grid turning them Wild. If you've retriggered the spins then both pairs of Sticky Wilds will do this, thus you can get up to 8 randomly positioned Wilds on top of the 4 sticky ones. The pays tend to be quite decent as it's hard to get a poor round with the stacked icons and extra Wilds.